Embark on a new career path or further your current role to introduce new, exciting treatments to your clinic at our professional, award-winning medical aesthetic training academy. This course will ensure that you are fully compliant and legally equipped to offer the latest methods in Laser Tattoo Removal. By learning the theory, methods and procedures behind laser hair removal, you will be able to implement this popular treatment within your own clinic. Training will be delivered by award-winning semi-permanent makeup professionals, guaranteeing a course of the highest standards. Give your clinic a definite edge through this Level 4 course, by becoming fully qualified in this fast growing, highly profitable treatment. This course will cover the science of the skin, & guide you through the latest complex facial treatments, including micro-needling and chemical peels. Begin your training in IPL and Laser technology. This vital course will give you the foundation you need to specialise in Laser treatments. Your beauty training begins here! By completing this Level 3 course, you’ll open many doors & be on your way to setting up your very own clinic. The start of your journey into the beauty industry begins here. 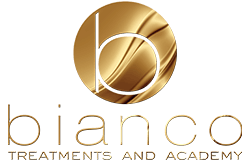 Bianco Academy can offer extensive support, enabling you to develop a highly lucrative business.